There’s good news and there’s really good news. This is the case of the latter, as last week’s mobile re-release of SEGA’s seminal platformer Ristar showcases vastly improved emulation. The first batch of SEGA Forever titles left a lot to be desired. In fact, they were approaching unplayable even on high-end mobile devices. Ristar however runs smoothly, has less finicky touchscreen controls and overall improved presentation. This is all thanks to a new core emulator, and word has it that the launch titles are also due an overhaul. SEGA are listening to fan feedback, it would seem, which is encouraging for the future. 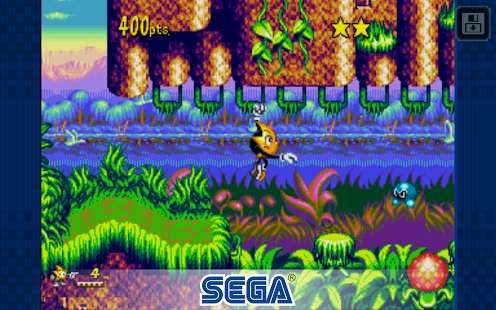 Ristar was a late (1995) release for the Mega Drive, tipped by the gaming magazines of the era to be Sonic the Hedgehog’s successor. That never happened due to less-than-great sales, and perhaps being nothing more than a marketing ploy – what good would have come from ditching Sonic? It’s not as if the hedgehog’s popularity was in decline at the time. Ristar remains an excellent game, showing what the Mega Drive was capable of. It’s very similar to the original Rayman, due to the ability to grab and throw objects via a pair of stretchy limbs. Ristar’s original design was in fact a rabbit who’d grab things with his floppy ears; a design that can be traced back to Sonic’s conception. Boss battles are both fun and creative, and the whole thing is backed by a jaunty soundtrack. We can safely say it’s well worth a download. While SEGA may struggle to get Saturn and Dreamcast games running smoothly on mobiles, we are at least now confident that all future Mega Drive re-releases won’t arrive in a shambolic state.